PITTSBURGH — After a thrilling win against Mercyhurst (13-18-5,11-13-4 AHA) and some help, the Robert Morris men’s hockey team (12-20-2, 11-15-2 AHA) clinched home-ice in the first round of the Atlantic Hockey Conference. The Colonials will have to win a best-of-three game series against Holy Cross to have a chance at the playoffs in Buffalo, New York. In a surprise year for the Yellow Jackets, they won the AHA by one point over Bentley. The Jackets have won six out of their last nine, including splitting a series with Sacred Heart. AIC received 21 votes to be ranked in the USCHO.com op-25, the most of any unranked team. On the year, the Yellow Jackets have been led by their powerplay. Operating at a 20.5%, the AIC man-advantage is top-20 in the NCAA. Scoring-wise, the Jackets are led by 5’9” junior forward Blake Christiansen who has 49 points (13g, 29a) this year. The Jackets will have a first-round bye and then host the lowest remaining seed. Bentley, similar to AIC, has had unforeseen success this year, as they finished the regular season second in the conference. However, Bentley is coming into postseason play winning only one of their last five games (1-3-1). In the USCHO.com top-25 poll, Bentley received one vote. The strong suit for the Falcons has been the goaltending this year. In 33 games, junior netminder Aidan Pelino has a .904 save percentage and 2.59 goals against average, both of which are top-50 in the NCAA. Scoring-wise, the Falcons are led by Luke Santero, who has 35 points (11g, 24a) on the year; and Drew Callen, who has 32 points (10g, 23a) this year. Bentley has a first-round bye and then will host the second-lowest remaining seed. Normally the cream of the AHA, winning the tournament the past two seasons, the Falcons continued their success in the 2018-19 season. One of, if not the best goalie in the conference sits between the pipes for the Air Force. Billy Christopoulos is top-25 in the NCAA in both goals against (2.13), and save percentage (.919). Offensively, the team has not been all that great. The Falcons’ powerplay is operating at a 21.3%, and their leading scorers, Evan Feno and Matt Koch each have 22 points (Feno with 11g, 11a; Koch with 4g, 18a). The Falcons have a first-round bye in the tournament and will host the highest seed from the first round. Sacred Heart’s strong suit this year has been playing against AHA opponents. 14 of their 15 wins have come against conference opponents. Sacred Heart comes into the playoffs on a roll, winning 8 of their last 11. In-conference, the Pioneers are averaging 3.02 goals per game. Scoring these goals is freshman forward Austin Magera. Magera has 25 points this year, 13 of which are goals. In goal for the Pioneers, is Josh Benson, who sports a .904 save percentage, and 2.37 goals against average in 22 starts. In the playoffs, the Pioneers will have a first-round bye, then will host the #5 ranked RIT Tigers in the second round. For the Tigers, their main problem has been penalties. The team has taken 171 penalties on the year, or five a game. Luckily for the Tigers. Their penalty kill is operating at an 82.5% kill rate. Leading the way for the Tigers are goaltender Logan Drackett, and senior forward Abbott Girduckis. Drackett has a .911 save percentage, and 2.58 goals against. In terms of scoring, Girduckis has 34 points (10g, 24a) on the year, most on the team. RIT has a bye week in week one but is on the road to face No. 4 Sacred Heart in round two of the AHA playoffs. Niagara has lost only one of their last five games (2-1-2), and recently swept the team they will be facing in the first round, Canisius. Niagara is lucky to be hosting this round, as the Purple Eagles have a 4-12-2 record on the road. One area to watch out for the Purple Eagles is when they are on the penalty kill, as they have scored nine short-handed goals this year. Niagara has two leading scorers, both with 34 points on the year. Ludwig Stenhouse (19g, 15a), and Noah Delmus (12g, 22a) are scoring threats to watch out for Niagara. The Purple Eagles will host #11 Canisius in the first round. Mercyhurst is coming into the playoffs having lost their last three games, and not having won since February 1 against Canisius. A weakness of the Lakers is their defense and goaltending, as the team is allowing 3.5 goals per game. One reason for this is the goaltending corps of Garrett Metcalf, Stefano Cantali and Colin DeAugustine. This trio has a combined .896 save percentage and 3.45 goals against average. Offensively, the Lakers are led by Joseph Durzak, whose 45 points (16g, 29a) are best on the team. In the playoffs, Mercyhurst will host #10 Army in the first round. The Colonials managed to squeeze out a home-ice advantage in the first round last week by winning Saturday’s matchup against Mercyhurst. Similar to Sacred Heart, the Colonials are coming into the playoffs hot, winning their last three. Statistically, the Colonials get shots to the net, but can’t seem to finish. Of the Colonials 898 shots on goal this year, only 85, or 9.5% have found the back of the net. 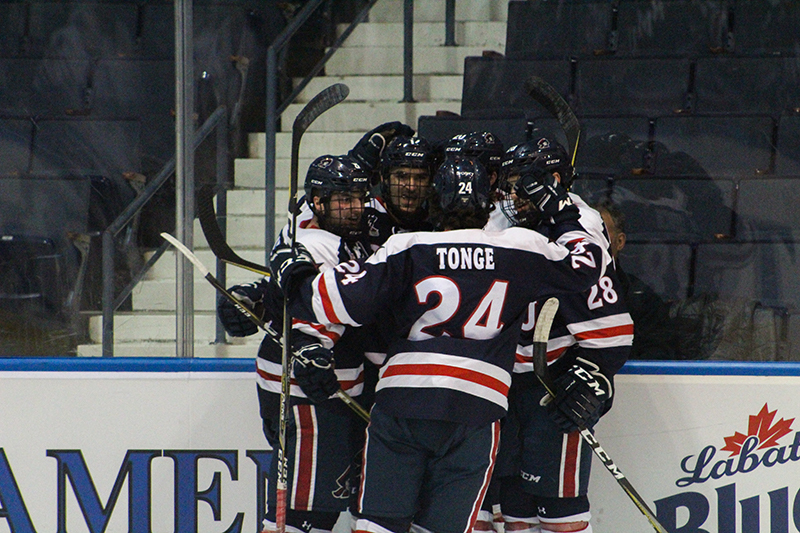 Scoring wise, the Colonials are led by Alex Tonge, who has 33 points (17g, 16a) in 32 games played this year. Robert Morris will host #9 Holy Cross in the first round of the tournament. Tied with the Colonials in points, but losing out in a tie-breaker, the Crusaders have a perfect chance to play spoiler against the higher seeded Colonials. In their last five games before the playoffs, Holy Cross has a 2-1-2 record. The Crusaders have three players all tied with the team lead of 21 points; Mitch Collett (9g, 12a), Johnny Coughlin (7g, 14a) and Anthony Vincent (5g, 16a). Erik Gordon will most likely be in between the pipes for the Crusaders. Gordon sports a 6-14-4 record and 3.06 goals against average. Holy Cross travels to No. 8 Robert Morris in the first round. Although Army is the 10 seed, they have performed well against Mercyhurst this season, winning three of the four matchups. One thing that Army can do is get shots to the net. The Black Knights have taken 979 shots this year, or 28.8 per game. The heart and soul of the Army team is Dalton MacAfee. Not only is the senior defender the captain of Army, but he also leads the team with 53 blocked shots, but also 30 points (6g, 24a). In the first round of the playoffs, Army will be hosted by No. 7 Mercyhurst. Even though Canisius is the “host” of the tournament, the Golden Griffins didn’t do themselves any favors in the regular season. Finishing last in the AHA by 3 points, Canisius has not had their strongest year ever. Canisius is led by Lancaster, New York native Dylan McLaughlin, who has 37 points (19g, 18a) on the year. The Golden Griffins will face #6 Sacred Heart in Fairfield, Connecticut for their opening round of the tournament. I predict that #3 Air Force will win the AHA and represent the conference in the NCAA tournament. Not only do the Falcons have the pedigree and the poise, but Billy Christopoulos is one of the best goalies in college hockey right now. For my upset prediction, I have #10 Army beating #7 Mercyhurst. The Lakers goaltending is suspect right now, and Army has had success over the Lakers this year.